Today it’s “Try it on Tuesday” and I trying out a new ruler…it called The Learning Curve Ruler by Linda Warren Designs. I had fun testing it out and am looking forward to a time when I can make more blocks or a fun quilt border with the ruler. At first I was a little confused with all the markings on the ruler, then I read the directions and made a block and the marking made sense. (I admit, I am one of those gals who just tries to figure things out without referring to directions.) This is a ruler you will have to read the directions to use but the it’s a breeze after you make a couple blocks. In the photo the directions look a bit intimidating but they are not. Each row gives directions for different method. There are six methods to use the ruler BUT those methods can be combined with other features giving you LOTS of options for blocks and borders. I am going to demonstrate how to make the method #6 pattern. Cut along the curve with your rotary cutter. You will get two inside curved pieces and two outside curved pieces. Sew them together as you would a Drunkard’s Path block. Don’t worry or fret about the start and finished edges to match. They won’t and it’s okay. Trimming will make it all perfect. You will get pieces like this. Press the seam to the dark color. Take the pieces to your cutting table. Lay the ruler over the blocks aligning the #2 and #3 dots on the curve. Then cut with a rotary cutter. Turn the unit, align and trim the remaining two sides. Wa-La…you have your block. Make a couple more and sew them together to create some blocks like this. So what do I think of the ruler…It’s nice. It’s easy to use. I know I have made curved blocks before and this is the most accurate method I have tried to date. I like that the sewing doesn’t have to be perfect and that the trimming “cleans” it all up. I would love to take the time to make a fun border with the Method #3. That would make an AMAZING quilt. I am typically not someone who like to trim but it’s worth it to have perfect blocks. This ruler really takes all the fear of curved seams away. Even more than the blocks, I like the options for border designs. It’s really great that so many options are available in one ruler. If you would like your own ruler, you can order them here. 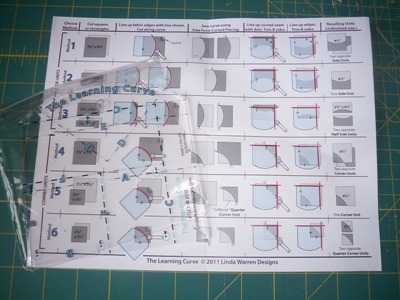 The Learning Curve Ruler is so new that they aren’t in all quilt shops yet!! Linda Warren Designs creator of the ruler has a Facebook page where you can see more quilts to make with the ruler. Feel free to “like” her page. With this ruler being so new, more quilts will be showing up on her page giving you inspiration to make your own quilts. Would you like a chance to win a ruler? 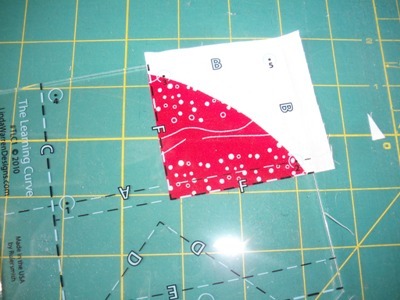 Just leave a comment here telling if you have ever made a block with curved seam. Thanks so much Linda for sharing your great new product with me and all my readers. Before you go…here are the winner of recent giveaways here. The winner of last week’s book Slash Your Stash by McCall’s Quilting from Martingale and Companyis… Rhonda Desgranges who said, “I like the one with the applique border and scalloped edge. It has a great vintage look. Great giveaway! Thanks for the chance to win!”. I’ll pick this week’s winner next Tuesday when I’ll be back trying something else that’s new! This entry was posted in Try it on Tuesday, Tutorials on March 27, 2012 by Jo. http://moderndiary.blogspot.com/2012/02/weekend-sewing.html you have to scroll down to see it, but I TRIED out several different layouts of my Bonnie Hunter Cheddary Challenge blocks! I’ve used the GO! Drunkards Path die, but saw other quilts made with this or a similar ruler. The variety with this one looks really fun. I am still a bit intimidated by curved piecing, but I have made a few 6″ fan blocks (similar to your demo) for a guild project. I am amazed that you don’t have to clip your curve using this ruler! Sounds MUCH less intimidating! I’ve never made a block with a curved seam but would love to give it a try. That ruler looks like it would be, not only easy to do, but fun as well. Thanks for the chance. Interesting ruler…would be fun to try. Thanks for the introduction! wait. That ruler looks interesting. Thanks for the chance to win!!! 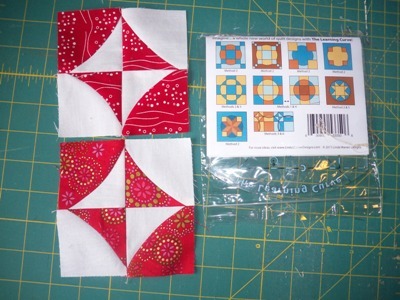 I’m in the process of doing the NY Beauty QAL and those 2 blocks I’ve done so far would be my first at curved pieces. Love the blocks that you made with the ruller – looks like fun. Thanks for the chance. I’ve made several Drunkard Path’s variations. Just made one in 6 inch style for my block round robin. Would love to test this ruler for more ideas! I haven’t made blocks with curves before, but I retire soon, and will have the time then! I used to think specialty rulers were just gimmicks, until I made a Bonnie Hunter quilt. Now I love them! I have not made any blocks with curved seams…yet! This ruler may just be the tool to get me to try some! Thanks for sharing about it. The ruler looks like one I would just love to try! I have made a drunkard’s path quilt based on a Pepper Cory quilt that I just absolutely adore!!! Quilts with curves add so much more movement and play, but tools to make them are a big help! I have done some curved piecing, but it was a nightmare (my indian orange peel has been waiting a year for me to get up the courage to go back to it!). I love your test blocks and could see a whole scrappy quilt made from these blocks!! I have made Drunkards Path blocks and I think it would fun to try a new technique. Thank you for this give away opportunity. I have made curved blocks and it was so stressful trying to get the two pieces to sew correctly. I didn’t think that I would every do curves again. This looks promising and I love the blocks that you demonstrated. I am in a LFS block of the month & my next block includes 9 mini blocks with concave curves on light background. Holly our wonderful leader showed us 4 ways to do curves! I’ve set-in sleeves, so not worried. This block will be made this week-end…. Wish i had that ruler! Thanks for the chance to win! Back about 5 years, I cut and cut Drunkard path pieces out to sew together at that years retreat. I sewed probably about 20 or 25 together and they just did not jell and that’s where it been sitting. I would love to try it again but am afraid that is just where it will stay. Also have done a fan quilt that the fans formed a heart, remember that turned out fine but was a bigger block. Also have sewn many centers to Grandmother’s Flower Garden blocks – no problems. That ruler looks interesting, would like to try it – may need to check it out if I don’t win. Thanks for the opportunity to enter. Robert, in northern Iowa. I’ve attempted some drunkard’s path blocks before, but I wasn’t happy with my accuracy. Maybe this ruler is what I need. I have never ever made a block using curved seams in all my 30 years of quilting! I’ve been just to chicken to try having to match up those points but I love the way this ruler takes that problem away!! This ruler could just be the answer for this big chicken lol! Like everybody else, I’ve tried curved piecing. Most of the time I’ve used the Crazy Curves templates, which I’ve had good luck with. What I like about this is the multiple looks you can get with one gadget. Gotta love gadgets! Wow that ruler looks awesome! I have never really tried to do curves because they look so hard to do. This looks really simple. I made some Drunkard’s Path blocks using templates one. I’d love to try this ruler! 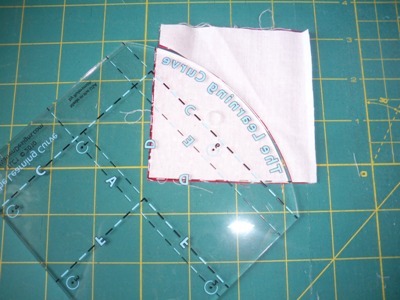 I have done some curved pieces – using the special foot on my Bernina – but this ruler looks like it would make it easier. Thanks for the chance to win. I have never tried a curved peiced block but sure would like to win this ruler to make one. I’ve made some wall hangings using curved edges…this ruler looks like it could have been a whole lot easier and would sure like to win one!! I’ve never made a block with a curve before – too chicken to try it because I just know I’ll flub it up and never want to try again! ;-) I feel like I waste my time when I keep trying to do something and it never turns out. Sigh. I have made an wall hanging with curves a long time ago – this ruler looks like it would be fun to have around and play with. I’ve never done a curved seam in a quilt. Not on purpose, anyways. which I admit are not many right now. I made curved seams once when I was working on a block of the month. I was very intimidated by them! This ruler looks like it would make it fun! I have made two quilts using curved seams! Both are two of my favourite all time quilts..so worth the extra bit of work. I would LOVE to try out this nifty little ruler as I LOVE these blocks! Thanks for the chance! I have done curved piecing before but I really like the way the new ruler does it without all the fuss about things matching up! Yes, and it was scary – LOL! I would really love to try this ruler! I have only made a few Wedding Ring blocks. I’ve been a little afraid of the curved piecing. I’ve made Drunkard’s Path blocks using acrylic templates. They were fine, but I like the versatility of this ruler. I’d love to win! The blocks that you made look really cool. I have not tried making curved blocks before. It looks hard to do but with it ruler it looks easy!!! Wow! I really like this ruler. I made a Grandmother’s Fan quilt and a Drunkard’s Path quilt but using that ruler to make something would make things so much easier. I’m a big fan of trimming something down for better accuracy. I have made the occasional curved pieced block, but not a lot of them. The one that comes to mind is a Drunkards Path block in a sampler quilt I made quite a few years ago. I have never made one with a curved seam but I would love to try. I have made a small wall quilt with curved seams. My biggest problem was with getting the blocks square. This ruler looks like it would solve that problem. Cool ruler! I haven’t seen it before. I have made many drunkard’s path block, but sewed them by hand, not by machine. Hi Jo, Great blog and instuctions! I am drawn to quilts with curved edges and thought someday when I’m more experienced I will give them a try. But for now they just intimidate me. I think your border idea is perfect and I love the red and white. and I can’t believe all the options….wow. I’ll have to give it a try. I made a hand-pieced drunkard’s path block in a basic quilting class I took with my mom 20+ years ago. I can’t remember trying a curved block since. This ruler would be fun to try! No, I never have either. I think because it “scares” me but maybe that ruler would take the scariness out of it ;>) thanks for the chance to win! 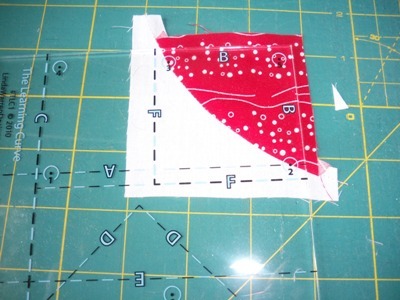 To date, I have made exactly one block with curved pieces for a Civil War sampler quilt. It worked out fine in the end, but had to redo some of the curved seams more than once! I’ve not been brave enought to tackle curves but always admire them. This ruler looks friendly. I would love to try it on! I have never had the courage to make a curved seam – this ruler looks like it would conquer my fear! Thanks for the demo and chance to win!! I have done Drunkerds Path, Double Wedding Ring and a Mariners Compass that all had curved seams. This ruler looks very interesting and I love the red and white blocks. I have never done curved seams, but your example certainly make it seem easy. Really like the block you chose and all the points match!. Thank you for the giveaway. I have never made anything with curves but reading this post with this ruler it does not look to hard. I would be very happy if I won this ruler. Thanks. I have a double wedding ring all cut out that has been patiently waiting for me to get busy on for at least a dozen years. I did a couple of the curved blocks and put it away for another day. Yikes – 12 years?! Imade a Druckards Path Block and it was nopt as hard as I thought it would be. Yes, I did have to ripit on a couple blocks because they weren’t just so perfect andf that was part of my learning curve. No I haven’t tried curved piecing as of yet, but I love the little blocks you made. Trimming after the fact would be a way to go for me for sure. I made my daughter a Double Wedding Ring Quilt for her wedding. It was done in black and white prints and it came out very nice, if I do say so myself. I haven’t tried sewing curves. I haven’t been quilting a year yet and am saving that for later. This new ruler looks awesome for cutting curves. Perhaps if I win it, I will push sewing curves to the front burner!! Thanks for the chance to win. You always have such great give aways. 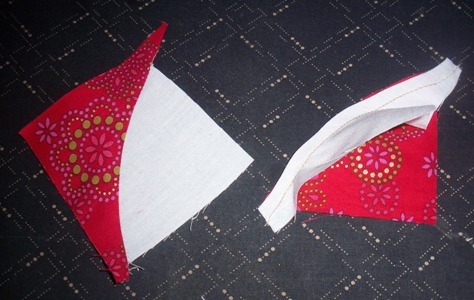 Yes, I’ve done curved piecing: Drunkard’s Path & Daisy Chain. I love how cute those blocks are & would like to know about all the border options also. I am off to friend her on FaceBook. No, I haven’t tried curve piecing, yet. I’d love to try Drunkard’s Path sometime, but usually chicken out when I think of the pinning and easing it takes. I’d love to try the ruler! I have made drunkards path blocks before and was thinking about trying it again. But, if you are giving away a new ruler I thought I’d love a chance to try a new curved design so I will wait until you draw the winner before starting anything. Would love to win it. Thanks for the chance. I have never done any curved piecing, but with this ruler I would definitely would give it a try. Thanks for the chance to win. I’ve yet to sew a curved seam; or even consider one for that matter. Your thoughts on the Learning Curve ruler makes it seem possilbe…thanks for the review and the chance at your giveaway. I have made the drunkard’s path and a bubble block in my block of the month class. We learn a new block every month. I made a whole Double Wedding Ring quilt…..by hand!! I’m a trimmer – otherwise I wouldn’t get my piecing to match! But trimming Drunkards Path type piecing doesn’t work so well, this ruler looks like the answer. I have a thing for rulers. Sure hope I win!!!! 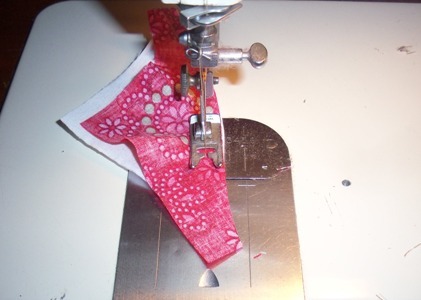 Oh…curved seams…AGH! This makes them look do-able! Thanks for the review….think I would like to give it try! To be honest I have avoided curved seams like the plague, until last week. I found a Marti Michelle winding ways template set and thought I would give it a whirl. The block actually came out really good. My thoughts on making bigger and then cutting smaller is usually I don’t want to. I know though there are times when it is better to do it that way. Sometimes the end result is far more important than a little whacked off fabric. I really like the 4-patch you made. Blocks with curved pieces scare me but I would love to give them a try with this handy dandy ruler! I have tried a few blocks with curved seams but never more than a few in one piece. I am not a “gadget person” and usually try to work out how to use my regular basic rulers for what I want to do.Tthe Learning Curve ruler looks like a winner and one I think would be good for our art group project. I made one Drunkard’s Path block many, many years ago. I think this ruler would make the pattern much easier to make. Oh yes, I made some blocks like this, but bigger using another ruler set. I ended up trimming them a bit smaller than they were supposed to be and ended up with nice accurate blocks that had a bit of an ‘off’ size. It didn’t matter because they all went together. This ruler seems to be more flexible. I would love to see all the options. The only curves I have done are the curves of clothing around the neck. I would love to see the ease of doing more curves in quilting. I made about 8 drunkard’s path blocks about 4 years ago. I really enjoyed it and was so excited….but I had another quilt that had to be done first, then something else caught my eye…..and I never got back to them. But I’m going to do a quilt soon with curved piecing!!! I’d love to try out curves. I have always feared to do so before since… well… fabrics are pretty expensive over here and I don’t want to mess things up… I guss that I would surely give curves a try with that ruler! I’ve made some blocks with curved seams, but they’re not my favorite thing to sew. Perhaps this ruler would make it easier? I did a drunkard’s path variation for a small wallhanging one time. Don’t like curves, but this ruler might make them fun. Miss Jo. That is the coolest ruler I have seen. I have made the drunkard path and a turtle with the curved seams with all the pinning and slow going of that. This ruler looks like something I will have to have. And the #6 block would be a perfect border for my Bonnie Hunter ..My Blue Heaven…mine is Red Heaven and bigger but this would be a great border. Glad you and Miss Kellie are having fun with Bonnie. Happy Quilting and God Bless you and yours…. I have yet to summon up the courage to try curved seams.. this ruler looks like it would give me the faith in myself to try. I have a drawer full of rulers, but none for curves. Would love to win this. I generally steer clear of patterns that use curved pieces. This ruler looks like the kind of tool I need in order to be brave enough to make curves. I’d like to give it a try. Thanks for the demo of the “Learning Curve” ruler. I enjoy trying new rulers to learn new techniques. I am 67 years young and love that new tools keep coming out for us quilters. I think think the name of the ruler is appropriate for my age group. We’re never to old to learn new tricks! Age is just a number. At our local quilt shop “Quilters Refuge” I was the designated person to try out new rulers and make shop models using them. Alas, our quilt shop closed in 2011. So sad for all of us. We have very few quilt shops in Alabama. Quilters Refuge was the best in the state. So enjoy your blog. I visit it every day. I envy you and Kelli visiting the retreat with Bonnie in Moline. I haven’t made curved blocks yet….but, always willing to try something new….thanks for the opportunity to try!! I have made a drunkard path quilt and am now doing the New York Beauty quilt along. This looks like a fun ruler to make more curved blocks for a quilt. Thanks for the chance to win. I just finished hand stitching my first Drunkard’s Path block…this ruler will come in handy for the jazillion more blocks I need to finish this into a quilt!! !